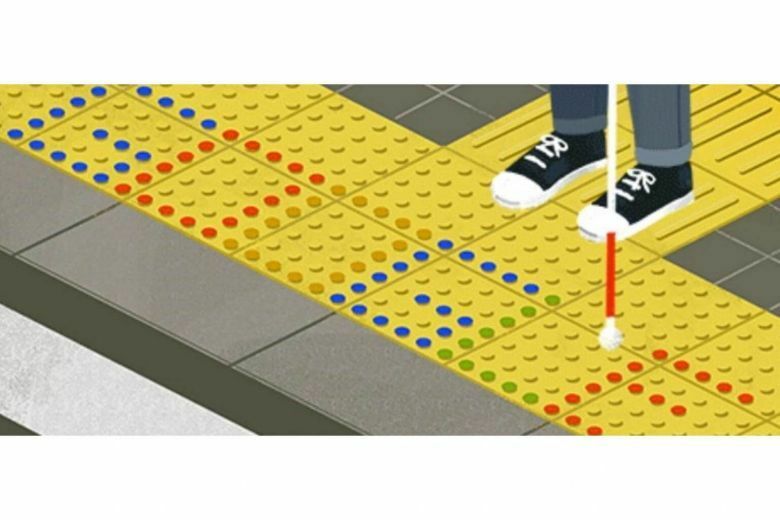 Google Doodle is honoring the life-changing invention of tactile paving by Seiichi Miyake on the 52nd anniversary of its unveiling. Today's Doodle features the bright yellow blocks used in the original paving, which help the visually impaired safely navigate their way around urban spaces. Born in 1926, Miyake died in 1982, at age 56. In 1965, Miyake wanted to help his friend who was losing his sight, and so, using his own money, began work on the tactile paving, originally known as Tenji blocks, according to Google's Doodle blog. He came up with two designs. One incorporated raised dots that alerted the blind they were approaching danger, like a road crossing. The other had solid bars signaling guidance along a safe path. The different textures allowed the blind to feel their way with their shoes or a cane, or with the help of a guide dog. Miyake hoped this would help people with visual impairments travel safely through the streets. One objective was to make sure those who could not see well could board a train safely. On this day in 1967, a street near the Okayama School for the Blind in Okayama City, Japan, introduced Miyake's ingenious invention. It was then rolled out across Japan and made mandatory across its railway stations within a decade. The tactile paving is now a feature of cityscapes worldwide. Tactile paving has evolved over time, and nowadays there are different patterns for different messages. For instance, in the U.K., dots in a grid mean there is a dropped curb for crossing the road. If there are unaligned dots, it means there is a train platform and a possible gap. To warn people of a tram crossing, there are lozenges, while horizontal stripes mean there are stairs or an obstacle in front. The pavement can also be color-coded to help with those who are partially sighted. Bright, contrasting colors can warn people of a traffic-light crossing, according to the Britain's Royal National Institute of Blind People (RNIB). Probably unknown to the average pedestrian, the design standards for tactile paving in the U.K. are part of a document that is 100 pages long. Most sighted people would be oblivious to the frenzy of linguistic expression going on beneath their feet, and it is all thanks to Miyake's idea more than half a century ago. This story has been updated to include more details on the type of tactile paving in use.